FREE UK DELIVERY + £10 OFF YOUR 1ST ORDER. Enter 'NCD10' at checkout & click recalculate to receive your discount. 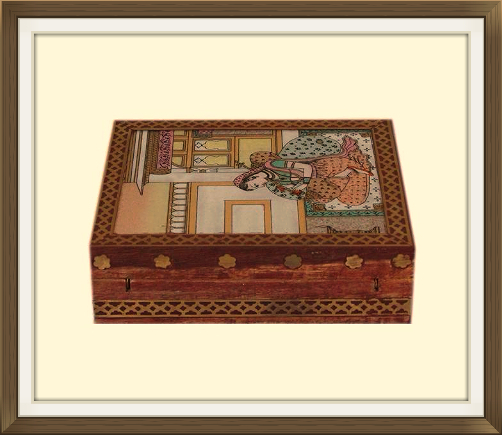 This is a beautiful vintage inlaid jewellery box, made in India and dating to the 1960s/70s. This beautiful box is made of wood and has a stunning inlaid picture on its lid. The picture is of an Indian scene and has been created using thousands of fine pieces of coloured glass. You can see the tiny particles upon close inspection and they sparkle gently when they catch the light. 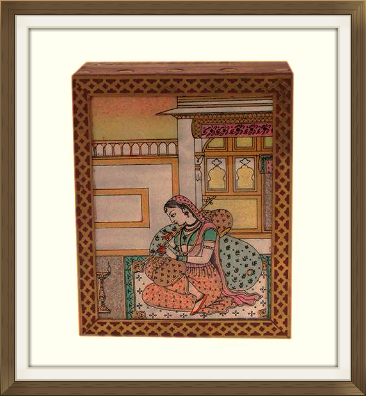 The picture is finely detailed with black and gold painted highlights. It is securely and neatly inset within the lid, and protected by a glass cover. 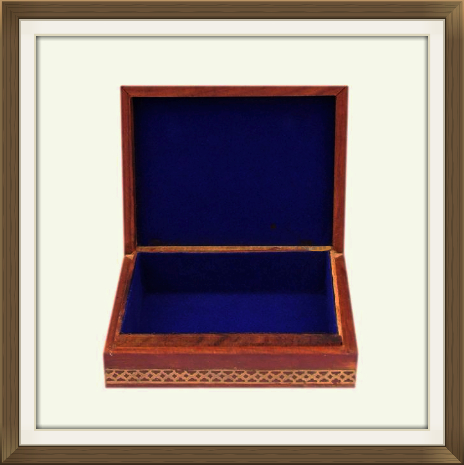 The lid is further decorated with an inlaid brass frame which has a beautiful trellis pattern, and there is further brass flower shaped inlay on the sides of the lid. The same brass trellis inlay runs around the base of the box. The bottom of the box is complete with its original blue felt covering. This will protect the surfaces of your furniture. The interior has a single compartment which is complete with its original blue felt linings. This matches the felt covering on the bottom of the box. 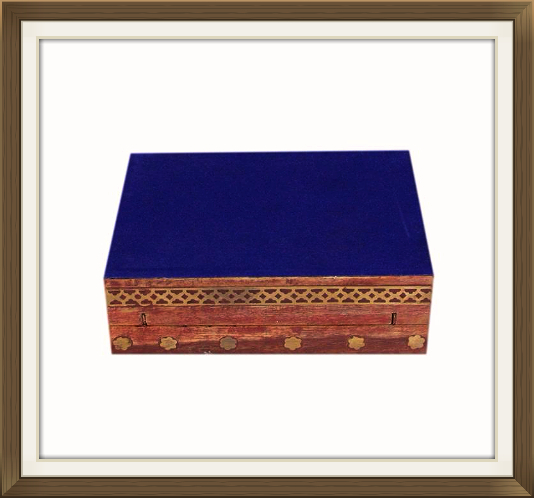 This very pretty box is in excellent condition for its 40/50 years of age. 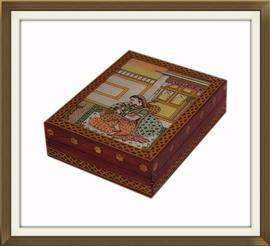 The inlaid picture is in perfect condition and there are no chips or cracks to its glass cover. All of the brass inlay is present and intact. The interior blue felt linings and felt covering to the base are in very fair condition with just minor spots of wear in a few areas. The lid opens and closes nicely and sits flush when closed. 11.4 by 8.7cm with a 2.8cm depth. The box will be posted FREE within the UK, by Next Day Special Delivery. International postage is £25, by International Tracked Post. Delivery is fast and within 3-5 working days to Europe, and 5-7 working days to the rest of the world. Enjoy £10 off your 1st order plus free next day delivery on any piece of jewellery. Valid for both single and multiple purchases. See website for details..